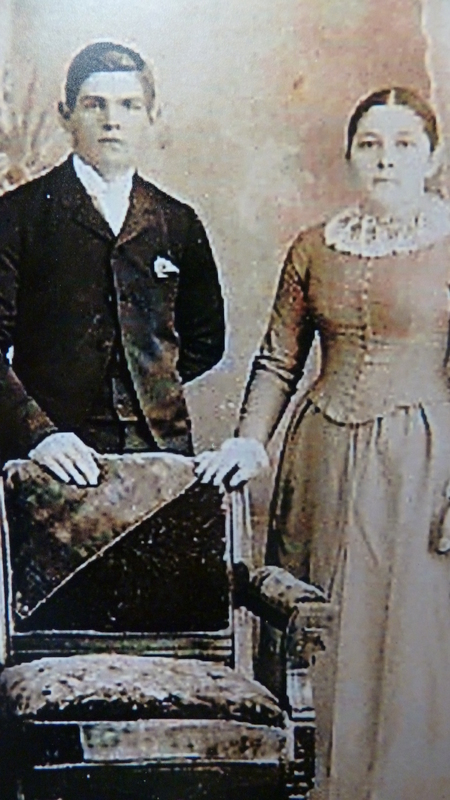 Uriah and Barbara’s wedding picture, 1893. They were married just eight years later than Laura Ingalls & Almanzo Wilder. Only eight generations back, my forebears came to America. Like a lot of other folks who grew up Mennonite, my early relatives were Amish. One of the most well-researched and documented genealogies is the Jacob Hochstetler family, with members numbering many hundreds of thousands today. Much is known about this ancestor Jacob Hochstetler, because his family suffered a tragic massacre during the French and Indian war in the Northkill Amish community in Berks County, Pa. Jacob’s young teenage sons reached for their hunting rifles in an attempt to scare off or kill the attackers, but Jacob was a true pacifist and would not allow them to shoot, even at the risk of their own death. I’m excited about a fictional trilogy recreating this history being written by Ervin Stutzman, moderator of Mennonite Church USA who during the last number of years has written about his own parents, Tobias of the Amish and Emma: A Widow Among the Amish. The first book in his “Northkill” trilogy is scheduled to be released next February in a volume called Jacob’s Choice. But here I want to tell you more about my grandfather on my father’s side Uriah Miller, a direct descendant of Jacob Hostetler. Some begats: my grandfather Uriah was the son of Moses, the son of Joseph, the son of Daniel, the son of Anna, the daughter of John, the son of Jacob Hochstetler the guy whose family was attacked. (John, who emigrated with his parents from Europe, was already married and living away from his parents when they were attacked.) That’s a lot of “begats” and eight generations by my calculation, starting with my father (I’m no genealogist or historian, so correct me if I’m not counting correctly). I knew Grandpa Uriah for the first 13 years of my life until he died in 1964, pictured here with his father Moses. 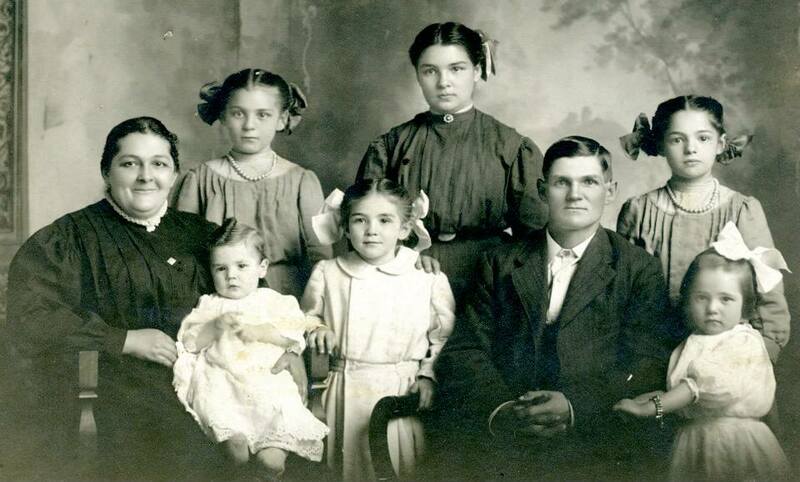 Bottom row: my great grandfather, Moses, with beard; my grandfather, Uriah, and grandmother, Barbara Kauffman Miller. I don’t know who else is in the photo. So Grandpa Miller was already 79 by the time I was born. My own father was the youngest of nine children, and 27 before he get married (not old by today’s standards, but old for those times). So that’s a little of why I had such an elderly grandpa. The Uriah and Barbara Miller family, before their three youngest children (two sons, finally!) were born. Photo courtesy of Dennis Risser. By the time I really had memories as a young child, Grandpa was already hunched and probably weighed less than 100 pounds. He was always small, especially compared to my robust Grandma (Barbara) Miller, but I like the above pictures because they show him as a much younger man, before he got hunched over and Grandma had a stroke. We were close to them because they lived in a “daughty” house (in-law quarters) attached to ours for about the last twenty years of their lives. 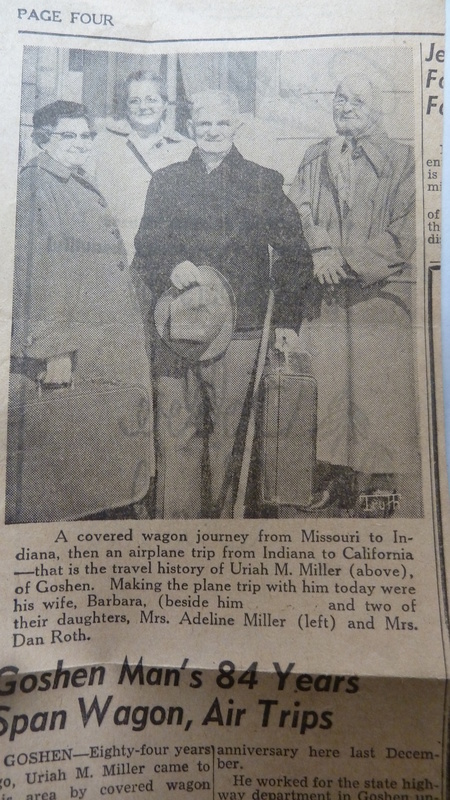 Grandpa’s life story spans from the covered wagon to the jet age—he personally used both modes of transportation, a story carried by our local paper at the time. He and grandma, ages 84 and 81, flew to California to visit a granddaughter and family. My Aunt Adeline, Aunt Susie, Grandpa and Grandma getting ready to fly to California to visit the Arleta and Marvin Mann family. Grandpa was born in Wheatland, Missouri during his family’s several year attempt to farm “out west” under very harsh conditions. So the family moved back to Indiana, traveling by covered wagon. When he grew up, he traded horses, earning him the nickname “Jock,” and spent 34 years as a farmer and thresher in northern Indiana and in lower Michigan , seen here. Later he worked for the state highway commission and after retirement, helped Dad farm. He was a grower of raspberries, roses, and an egg sorter in our family egg business. 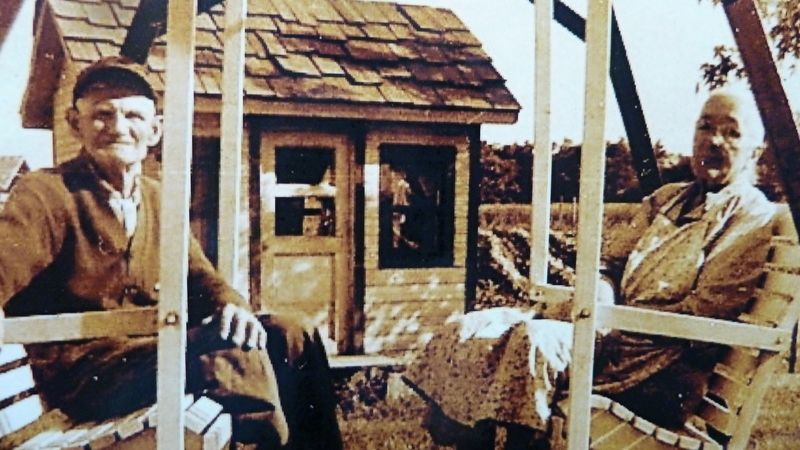 He was a lifelong Mennonite who chewed tobacco. As a kid I thought that was kind of edgy and cool. My Aunt Susie said that habit started because he had been told it would keep him from getting TB after his mother and several sisters died of the dreaded disease (11 children in that family). He always carried pink or white wintergreen mints in the pocket of his suit jacket well into his 90s and kid would line up beside him after church waiting for a piece. My father carried on that tradition in his later years. When I was at Amigo Centre earlier this fall, I learned from program director Mandy Yoder that her father always carried those mints for kids at his church, too. Mandy’s bowl of wintergreen mints in honor of her grandfather. Grandpa and Grandma the way I remember them best in their later years, on a favorite glider in front of our childhood playhouse. See more about the playhouse history in our family here. We were all close to Grandma and Grandma Miller—they rocked us, babysat us, and I loved riding to town with Grandpa in his old black Chevy, circa 1950, for his haircut or to pick up more mints (or tobacco). The grandchildren and great grandchildren (my first and second cousins) would come out to the farm to play and visit. I remember Grandpa taking care of me one time when I was sick and had to stay home from school. Momma was busy that day—I don’t remember if she had to go away, but I know he brought me a bucket or tissue or glass of water when I needed to upchuck. That memory always stuck with me—my 90 year old grandfather taking care of a 12 year old girl. 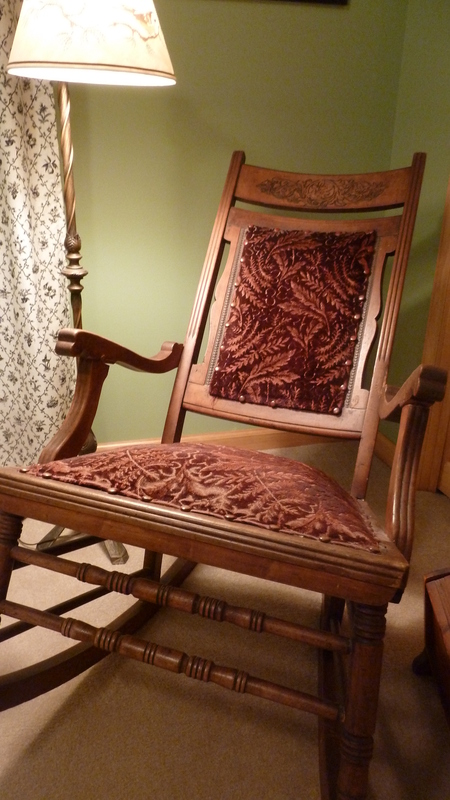 I still have his rocking chair. He and Grandma enjoyed 67 years of married life together. Grandmother died first in 1962 and Grandpa brought a fresh rose every day from the rose bushes they both loved to place in her hands at the funeral home as we received friends and sympathizers. Grandpa himself lived to within days of his 92nd birthday. But more than these memories, I treasure the faith of my ancestors–those like Jacob Hochstetler, who lived their beliefs. My grandfather didn’t go through anything quite as dramatic as Jacob and his family, but quietly and steadfastly lived their faith through The Depression, through losing two daughters, and literally, thick and thin. Grandpa holding one of his seven daughters. Grandma on right. Are you part of the Hostetler clan? Let me know or visit the official Hostetler website. I’m not aware of being part of the Hostetler clan myself, but I am looking forward to the publication of Ervin Stutzman’s book. I also really enjoyed your Grandpa’s story of thick and thin, tobacco (yes, my father was a user (and also a grower) too), mints (my grandpa also gave them to children at church) and faith lived quietly and simply in family, work, and church communities. These stories have the power to sustain us. And challenge us. Today. It is interesting to see how many folks are identifying with the mints … at church. When my father gave them out, toward the end of his life, he started saying he wasn’t sure if it felt “safe” to give them out anymore, worrying that people might think he had bad intentions. None there, or with my grandpa. And yes, I picked right up on your father using tobacco–and growing it. Fascinating stuff, our histories. It is neat when people besides my family get enjoyment and connections and memories from posts like this. Thanks for your comment, faithful Caro-Claire! I am from the Hostetler clan. My grandma always had her pink and white peppermint candy and the joy we had when we reached into her candy jar for just one piece. I remember one time when her candy got moldy. Moldy? Wow–I know some bags of candy that were old, but never got moldy. Nice to meet another from the Hostetler family. We had four Katies in my church: a Hershberger, a Hostetler, a Weaver, and a Yoder. Us kids had a fun little rhyme we’d say when we counted them up: Katie He, Katie Ho, Katie We, Katie Yo. Yes, I am that Alice. My gr grandfather was Daniel Morgan Hostutler. Good to know! Thanks for letting me know. It is great “meeting” these many distant cousins. Glad you know about Erv Stutzman’s book–are you a member of the Hostetler organization and get their newsletter? Advance excerpts of the book are coming out in their newsletter in 3 installments … they look good! I too am a descendant of Jacob Hochstetler, through his son Joseph. I thoroughly enjoyed reading this blog because of all the parrallels with my own family history. My great grandfather, John Mast, was also a livestock jockey. Selling horses, ponies and cattle. My grandfather, Leo Mast, was a farmer who partnered with another gentleman to buy a threshing machine, which they used not only on their farms, but they also did the threshing for many neighbors. What is really fun is that I just recently spent time with my father, Elvin and learned these details as he shared stories from his childhood. 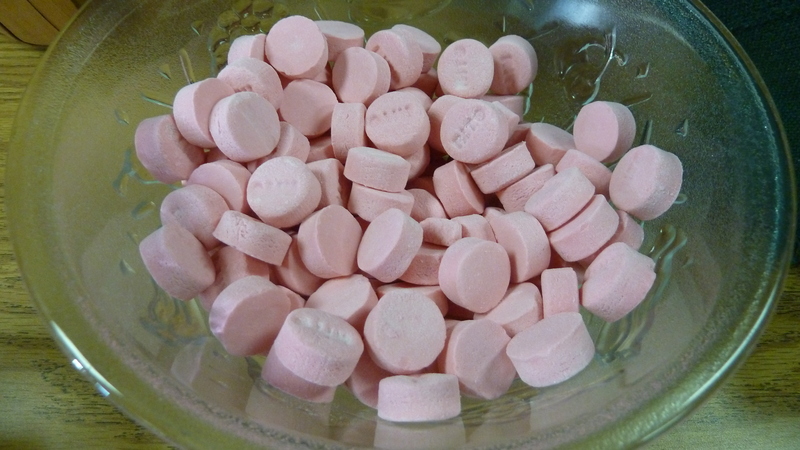 Memories from going next door to my Grandpa Leo’s include playing with the old wooden thread spools, enjoying mint tea made by my step-grandmother, and then just before we would depart, he would open the heavy wooden drawer that contained the bowl of pink wintergreen mints. Cheryl, this is just amazing–too cool. I will share your post with my mom–who is a faithful reader of all this on paper! Anyway, so great to hear of these stories and distant cousins. Jockey, threshing, and then the drawer with the mints. My husband says kids today would not be satisfied with a simple mint take away … I’m not so sure. Daddy made little weaving looms out of wooden thread spools with 4 little nails on top that you wrapped heavy string around which created a ropey thing. Do you know what I’m talking about? Anyway, thanks for more memories and sharing. Your response makes me want to go spend time with your mom! Kids today might not be satisfied with a simple mint…but I suspect that a rhythm of sharing a mint each time a child visits, would still carve a memory in their minds like it did in ours. I’m glad you wrote again here, I failed to realize which Cheryl you are but I’ve got it now!! You make a good point that “the rhythm of sharing a mint each time a child visits, would still carve a memory in their minds like it did in ours.” That is very poetic and well stated. I love it. And maybe Pert or I could come up with how Dad twisted the thread on the little nails on the spool. I will have to give it some more thought! If you or Pert can come up with more details about the loom your dad made, I’d sure welcome the knowing more. Am just returning from a trip to KS. While there I picked up a copy of Sharon Cranford and Dwight E. Roth’s book – “Kinship Concealed” – the story of Amish Mennonite and African American Family Connections.. Met a woman last week while serving with MDS in Shawnee, OK who is reading the book, and she encouraged me to pick up a copy since my genealogy goes back to Bishop Jacob Mast. I loved reading this post! What a story. I have been reading “The Oxcart Man” to my toddler and the one thing the oxcart man buys for his family at the market: wintergreen peppermint candies! I can’t believe I’m reading it here now, too. Isn’t that always the way? I will have to find and read The Oxcart Man to my grandbabies when they get old enough (one is 6 weeks old, the other is due any day). It is a wintergreen peppermint day for sure — and I almost forgot to include the picture in that post. 🙂 Thanks for commenting. My grandma Brenneman always had pink peppermints in her pocket. Nice to hear about a grandma with pink peppermints too! I am a descendant of Jacob, through Christian. 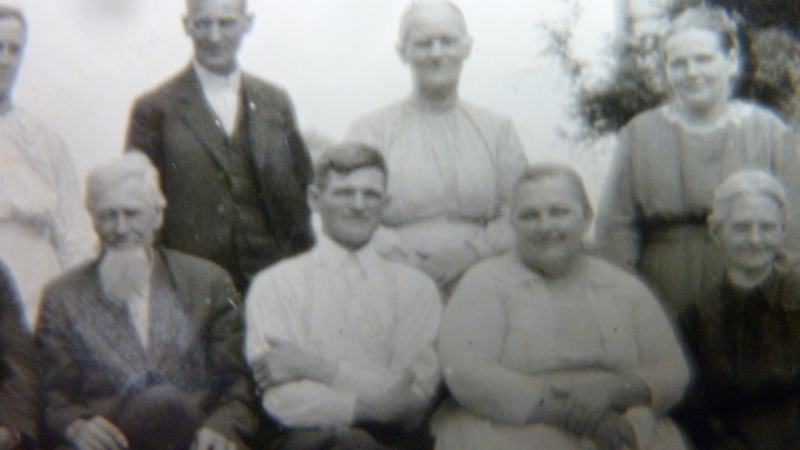 My Mom, Loretta Hostetler Black, her father, Evan W. Hostetler, his father Oliver Morton Hostetler, his father Jacob B. Hostetler, his father David Hostetler, his father Adam Hostetler, his father and mother were Christian Hostetler and Barbara Rupp, and of course Christian’s father was Jacob. Loved the post, enjoyed seeing the photos! Awesome! Thanks for tracing your “lineage.” Interesting for sure. Sometime when I was thinking genealogy, but after both my parents died, I was thinking that you and I were distant relatives through the Kauffmans, but was not able to figure it out. Your dad used to visit my dad occasionally. My dad was pretty much homebound because of Multiple Sclerosis, and didn’t get alot of visitors, which is why I was so impressed with his visits with Dad. Anyway, can you give me the names of some Kauffman ancestors so I can try to figure out the connection? 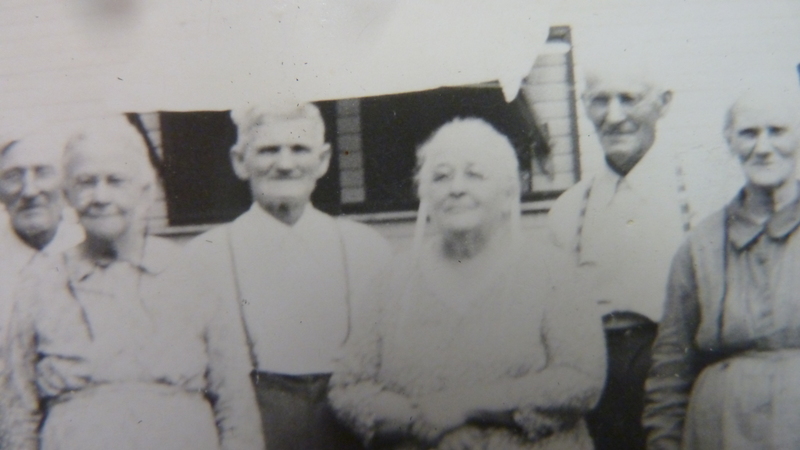 My grandparents were Henry and Amy (Yoder) Hooley, both of which had Kauffman ancestry. I know too we have some connection. 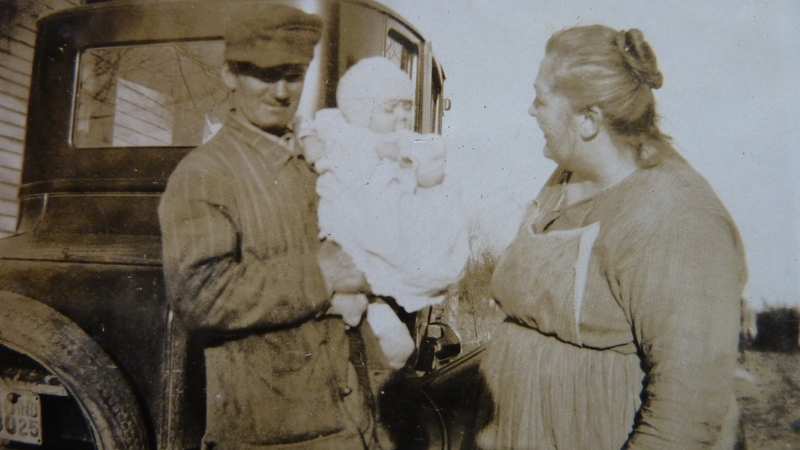 I hope to write about Grandma sometime but for now, her parents were Tobias Kauffman and Barbara Hershberger Kauffman. Tobias was the son of Benjamin and Veronica B. Kauffman in Holmes Co. Ohio. Barbara Hershberger Kauffman was born to Jonathan and Elizabeth Lehman Hershberger near Johnston, Pa. Does that help? My daughter who has done a lot of work on Ancestry.com may have more info than that, but I don’t have it in my collection right now. I Had “Miss Hooley” for a home ec teacher in Middlebury before I went to Bethany Christian and I know she was somehow related to me, and also Vic Hooley ice cream man in Middlebury. I have it figured out. Your Grandma Barbara was the youngest sister of my Gr-Grandma Mary Ann (Kauffman) Yoder. Mary Ann was the mother of my Grandma Amy (Yoder) Hooley, so my grandma and your father were 1st cousins. You, my father (Richard), and Uncle Vic (ice cream man) are 2nd cousins. As for your connection to “Miss Hooley” (the home ec. teacher) it may be another pathway. My parents always said our “Hooley connection” to her was not close enough to count. Elaine, that sounds right! Sounds like something my father told me, probably a dozen times. 🙂 Thanks for documenting it! Interesting what your parents said about the connection to Miss Hooley! But you had her as a teacher as well? I just checked on Shared Tree and discovered that I have to go back to the Hooley immigrant to get a Hooley connection to Ella Mae, making her about a 6th cousin to my dad. I do remember Ella Mae teaching at Middlebury, but since I didn’t take home ec. I never had her for a teacher. Oh wow, that is cool. I have not heard of Shared Tree. I wonder if my daughter has–who is the one who does most of the actual ancestral research in our family. Thanks! My Hochstetler relationship goes back to Jacob’s daughter, Barbara. I have recently read the book, Jacob’s Choice. We called it “spool knitting” that we did on the spool with nails. I do enjoy these blogs – brings back Indiana memories! I’m so glad to hear from you, Margaret! And about the spool knitting, I think that’s what called it too. I am a granddaughter of Joseph Eli Kauffman, Michigan, and Amish/Mennonite born around the turn of the century. They spoke dutch. Thanks for checking out my blog, Denise. We are likely distant cousins. You may enjoy my new post today–where I share a few Pa. Dutch phrases and words I grew up knowing without actually knowing they were Pa. Dutch!